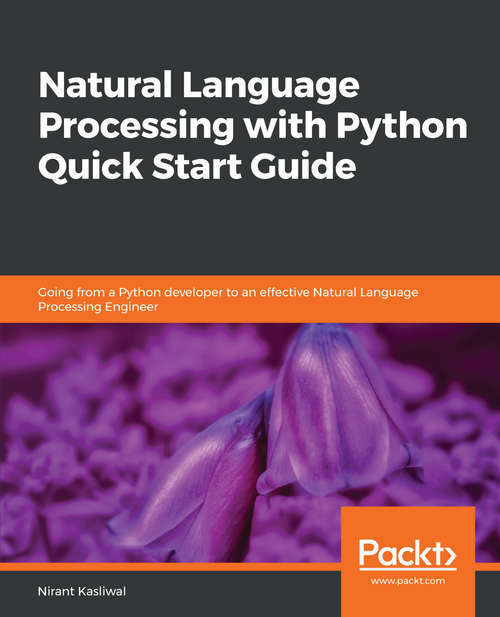 Build and deploy intelligent applications for natural language processing with Python by using industry standard tools and recently popular methods in deep learningKey FeaturesA no-math, code-driven programmer’s guide to text processing and NLPGet state of the art results with modern tooling across linguistics, text vectors and machine learningFundamentals of NLP methods from spaCy, gensim, scikit-learn and PyTorchBook DescriptionNLP in Python is among the most sought after skills among data scientists. With code and relevant case studies, this book will show how you can use industry-grade tools to implement NLP programs capable of learning from relevant data. We will explore many modern methods ranging from spaCy to word vectors that have reinvented NLP.The book takes you from the basics of NLP to building text processing applications. We start with an introduction to the basic vocabulary along with a workﬂow for building NLP applications.We use industry-grade NLP tools for cleaning and pre-processing text, automatic question and answer generation using linguistics, text embedding, text classifier, and building a chatbot. With each project, you will learn a new concept of NLP. You will learn about entity recognition, part of speech tagging and dependency parsing for Q and A. We use text embedding for both clustering documents and making chatbots, and then build classifiers using scikit-learn.We conclude by deploying these models as REST APIs with Flask.By the end, you will be confident building NLP applications, and know exactly what to look for when approaching new challenges.What you will learnUnderstand classical linguistics in using English grammar for automatically generating questions and answers from a free text corpusWork with text embedding models for dense number representations of words, subwords and characters in the English language for exploring document clusteringDeep Learning in NLP using PyTorch with a code-driven introduction to PyTorchUsing an NLP project management Framework for estimating timelines and organizing your project into stagesHack and build a simple chatbot application in 30 minutesDeploy an NLP or machine learning application using Flask as RESTFUL APIsWho this book is forProgrammers who wish to build systems that can interpret language. Exposure to Python programming is required. Familiarity with NLP or machine learning vocabulary will be helpful, but not mandatory.